When young lawyers Arou Bouya and Keita Daigo encounter a mysterious woman named Key at an amusement park, they are enthralled by her beauty and char. However, when they learn that she suffers from amnesia, they are compelled to help her. Before they know it, the unlikely trio is running a successful law firm! 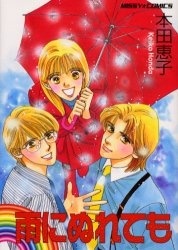 Ame ni Nurete mo was published in English as Over the Rainbow by Central Park Media on January 12, 2005.